Who hasn’t heard of *Eragon* by now? 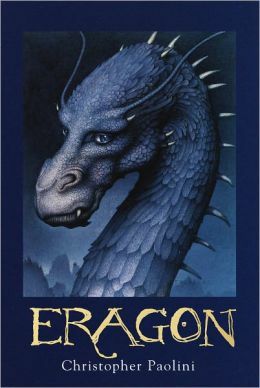 In this first installment to the Inheritance Cycle, written by then-teenager Christopher Paolini, we meet the brave-souled Eragon and his beloved companion Saphira, the little blue dragon hatchling who would go on to make dragons and epic novels about teens riding dragons popular throughout the world. He and she, brought together by an unlikely twist of fate, find themselves bound together by an undeniable friendship — and together they must rise against the oppressive forces of their troubled land to fight for their right to remain together, eventually finding themselves at odds with an evil king that wants to see both of them slain. I was skeptical upon first picking up Eragon. Its substantial length — well over 500 pages — along with its sharp and sudden rise to popularity kept me from reading it for years. I didn’t want to dive into a truly epic novel only to be disappointed by more pop culture fluff. However, I eventually gave in to peer pressure and cracked open the cover. And instantly, I found myself pulled into an irresistible world of gorgeous fantasy and imagination. From the start, Paolini’s world is deeply and masterfully invented, with no lack of description or realistic detail. Paolini’s literary scope and writing abilities are impressive, especially when one takes into account that he was only 15 while writing this novel. His prose presents itself with youthful poise and enthusiasm that is not found in other novels. He writes with enough authority that the reader is confident in his tale: he describes things so well, he seems to have experienced all of it himself. Aside from ripping and rumbling battle scenes, in which the teeth of vicious beasts and the roar of warriors feel startlingly up-close, other notably well-written passages include descriptions of the mountain range near Eragon’s home and of Eragon’s village harvesting and storing an autumn crop. These parts of the story are so beautiful the reader really feels present every step of the way. And some of the scenes in which Eragon is first riding Saphira are so breathtakingly written that I felt as if I myself were in the cold air with them! But Paolini’s descriptions are not the only neat thing about this book. It is impressive to see his abilities as a master storyteller, in the way of the ancients, come into play. His novel covers a wide and complex range of histories, locations, and storylines, digging deep into the essence of his fantasy realm. While other authors might lose hold of all these pieces, Paolini manages to hold the book together nicely, tying up loose ends, weaving everything together such that the story holds itself up in the grand, time-honored style of one such as Tolkien. Everything fantastical can be found in this land — elves, dwarves, dragons, shades, witches, even fairies. Paolini does not hold himself back when developing and creating this world. In some ways, it can feel a bit over the top — dwarves and elves? Maybe a little overkill? — but at the same time, one can feel how much he is relishing and enjoying himself as he writes, living out a boyhood fantasy of hiking through mountains with a dragon in tow, and this enjoyment passes itself on to the reader. For its well-handled broad scope, charming descriptions, and impressive storyline, I’d give this book 4 out of 5 stars. It’s an excellent read if one would like to curl up in a chair and forget themselves for a weekend, choosing a world with dragons over reality. (Here is where its long length is an added bonus; it’s a substantial and juicy read.) I’m not giving it 5 out of 5 because there are also some unimaginative elements to it — epic fantasy falls into cliche easily, and at times Paolini’s book does overdo things or wear out old ideas, including recycling concepts about magic and dragonriding already well-used by greats such as LeGuin and McCaffrey. Overall, however, it’s a beautiful story, meant to be enjoyed by those who love to immerse themselves in epic fantasy, or for those who want to live out — or relive! — childhood dreams.